Vintage - Roslyn Fine Bone China of England, 21-Piece Tea Set, Service for (6) Six, in the "Lily" Pattern #5481, Made from 1846 to 1963. Amazingly Beautiful and Brightly Colored Tea Set for Six in the "Lily" Pattern by Roslyn Fine Bone China of England. The Plate Pattern shows an opened Lily Flower on a Green Pad in the Water, with Trees Rising. These are scalloped, Hand Embellished with Red Enamel Stamens, and Gilded in 22kt Gold. Cookie Platter and Dessert Plats are Squared. All Pieces are highly Trimmed in 22kt Gold on Rims, Handles, Feet, and inside Stripe on Cups, Sugar Bowl & Creamer. 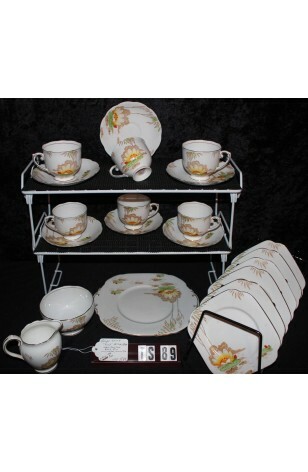 Amazingly Beautiful and Brightly Colored Tea Set for Six in the "Lily" Pattern by Roslyn Fine Bone China of England. The Plate Pattern shows an opened Lily Flower on a Green Pad in the Water, with Trees Rising. These are scalloped, Hand Embellished with Red Enamel Stamens, and Gilded in 22kt Gold. Cookie Platter and Dessert Plats are Squared. All Pieces are highly Trimmed in 22kt Gold on Rims, Handles, Feet, and inside Stripe on Cups, Sugar Bowl & Creamer. Great Resale Condition unless noted below or in pictures.